UMD faculty at the 2016 ARPA-E Summit. From left to right: Dr. Takeuchi, Dr. Ohadi, Dr. Wachsman, Dr. YuHuang Wang, Dr. Radermacher, Dr. Lei Zhang, and Dr. Srebric. Not pictured: Dr. Chunsheng Wang and Dr. Bao Yang. 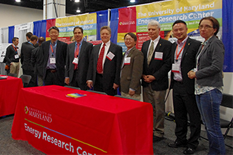 Nine UMD ARPA-E research projects formed an impressive “UMD Row” at the Advanced Research Project Agency- Energy (ARPA-E)’s seventh annual Energy Innovation Summit at the Gaylord National Harbor Convention Center in Washington, DC last week. ARPA-E, an agency under the U.S. Department of Energy, aims to advance high-potential, high-impact energy technologies. Projects are awarded ARPA-E funding because they are developing entirely new ways to generate, store, and use energy. “UMD scientists will radically improve U.S. economic prosperity, national security, and environmental well-being”, said Eric Wachsman, Director of the University of Maryland Energy Research Center and William L. Crentz Centennial Chair in Energy Research at the A. James Clark School of Engineering. The annual Energy Innovation Summit brings together energy experts from a wide range of technical disciplines and professional communities to work together to move transformational energy technologies toward market readiness. This year’s highlights included talks from Al Gore, former US Vice President & Climate Reality Project Chairman; Gina McCarthy, EPA Administrator; and Dr. Ernest Moniz, DOE Secretary. The Technology Showcase is also a huge draw of the summit, with over 2,000 attendees and more than 250 innovative energy technologies, facilitating many collaborative and investment opportunities. Eric Wachsman, Liangbing Hu, and Dr. Thangadurai (University of Calgary), are developing Safe, Low-Cost, High-Energy Density Electronic Vehicle Batteries. This technology applies revolutionary advances in solid-state-ionics and conventional ceramic fabrication techniques to develop high-energy-density, low-cost, all solid-state batteries. The all solid-state structure of this technology provides revolutionary dimensional tolerance and mechanical strength, decreasing packaging requirements and system weight. Ultimately this technology will dramatically reduce manufacturing costs using scalable, ceramic fabrication techniques. Chunsheng Wang is developing Aqueous Electric Vehicle Battery, which seeks to create an innovative battery technology that will not only be lighter, safer, and cheaper than current technology. The water-based magnesium and hydrogen chemistry improves energy density of the batteries, which will be built from safe, inexpensive materials, reducing the cost of battery management or replacement, improving reliability, and this will allow the batteries to operate across a wide range of temperatures. Ichiro Takeuchi is developing an Energy-Efficient Building Cooling system that eliminates the need for synthetic refrigerants that are harmful to the environment. Thermoelastic cooling systems use a solid-state material – an elastic shape memory metal alloy – as a refrigerant and a solid-to-solid phase transformation to absorb or release heat. This technology alternately absorbs or creates heat in much the same way as a vapor compression system, but with significantly less energy and a smaller operational footprint. Michael Ohadi’s team presented their Dry Cooling of Power Plants technology, which aims to reduce or eliminate water consumption in traditional thermoelectric power plant cooling systems. Ultimately the research team will select two novel heat exchanger designs that can radically enhance air-side heat transfer and create and test two 1kW prototypes. Bao Yang and his team are developing Innovative Absorption Systems for Supplemental Power Plant Cooling, which utilizes a novel microemulsion liquid absorbent to absorb water vapor and release liquid water. Waste heat from the power plant flue gas will drive the microemulsion cooling system to provide supplemental cooling below ambient temperatures. YuHuang Wang’s project, Thermally Responsive Fabric, will develop a meta-cooling textile that extends the skin’s thermoregulation ability to maintain comfort in hotter or cooler office settings. This technology aims to increase energy efficiency, reduce emissions produced by traditional HVAC systems, and enable more sustainable heating and cooling architectures for energy-efficient building design. Reinhard Radermacher’s team has been developing the Robotic Personal Conditioning Device, which will be a mobile platform to provide personalized cooling to individuals. This technology will contain a small, battery-powered, high-efficiency vapor compression heat pump to provide localized air conditioning as needed during the day while dumping stored heat and recharging batteries at night. Lei Zhang, Director of the National Transportation Center @Maryland, is developing iPretti, a technology that Optimizes Energy Efficiency in Transportation. This integrated, personalized, real-time traveler information and incentive technology will simulate the effects of traveler choices on energy use. By providing real-time, personalized information and incentives to users, the technology will result in collective behavior adjustments and significant system-level benefits and energy savings. Redox Power Systems, the fuel cell company that spun out of the University of Maryland Energy Research Center also presented at ARPA-E, displaying their “cube” fuel cell designed for distributed power generation systems. Their Fuel Cells for Transformational Energy Conversion maintain high power density and enable faster cycling, with dramatically lower operating temperature of 400 degrees C.